It is estimated that over 22,000 women in Canada will be diagnosed with breast cancer this year and nearly ten times as many in the United States. Almost a quarter of these people will die. Nobody knows why. Yes, there are established risk factors, such as early commencement of menstruation, never breastfeeding a child, late onset of menopause, all of which increase a woman’s lifetime production of estrogen. Then there is the inheritance of the long-researched “breast cancer gene”. These risks apply to approximately 30% of breast cancer cases, leaving the vast majority unexplained. For the past two decades, scientists like Devra Davis have been pointing the finger at “foreign” estrogens, contaminants introduced into the body from the environment, which can mimic the action of estrogen or alter hormonal activity. Synthetic estrogens, on the other hand, are difficult for the body to break down and can amplify the effects of naturally-produced estrogen. These synthetic estrogens – found in certain pesticides, plastics, fuels and drugs – have proliferated ( along with breast cancer) since World War Two. So, what do we know about these pollutants? For one thing, their strength magnifies in the food chain as, say, microscopic traces on phytoplankton are consumed by small fish, then larger fish, then mammals. They’re also lipid (fat) soluble, ergo store themselves in fatty tissue, like, oh, you know, breasts. For another, they can travel thousands of miles from their source before they are brought back to earth by cold climates. As a result, the people of Canada’s Arctic – recently listed by the Blacksmith Institute as one of the top 10 most polluted places on earth – bear the toxic body burden of their industrialized southern neighbours. Tragically, lab tests on the breast milk of some Inuit women suggest it should be treated as hazardous waste. Which brings me to one of the most shocking statements I’ve ever heard. It was made by breast cancer activist Judy Brady, who, at a women’s health forum in 1996, pointed out that women, unlike men, had a means of expelling these contaminants from their fatty tissue: through lactation. Yes, Brady said, there is more than one way breastfeeding can reduce a woman’s risk of developing breast cancer, but at what cost? In an article in the current issue of Watershed Sentinel, Devra Davis details what is known about the role synthetic chemicals are playing in the current epidemic of breast (and other forms of) cancer. In the speech Brady gave at that forum, she pointed out that the World Health Organization acknowledged in 1964 that 80% of cancers in industrialized countries were caused by human-produced environmental toxins. In other words, 80% of cancers are preventable. You’d think women (and men) would be marching in the streets, demanding these carcinogenic chemicals be removed from our environment and our bodies. Actually, back in the early 1980s, activists like Brady were doing just that. That women were angry was clear. That something was required to subsume their anger was even clearer. In an article explaining why she hates pink, Brady exposes BCAM for what it essentially is: a marketer’s dream come true. Taking the lead in facilitating this corporate “pink washing” in the US is the Susan G. Komen Foundation. 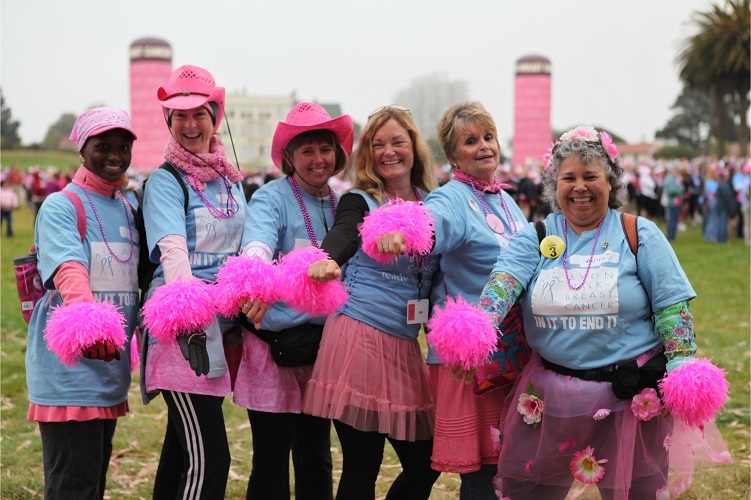 In January 2012 the Komen Foundation entered into a marketing agreement with the Canadian Breast Cancer Foundation (CBCF). According to their joint press release, “the two organizations will work with business partners to identify and develop products and programs available in both countries, with proceeds benefiting both organizations and the breast cancer cause.” Any mention of “benefiting” the cause by eliminating the production and discharge of the chemicals that cause breast cancer? Nope. I have no wish to offend any of the many hopeful individuals who will be running – or doing anything else – during BCAM this October. However, I do believe, as my grandmother used to say, that an ounce of prevention really is worth a pound of cure. So, I’ll be doing my own awareness raising: inviting friends round to watch the NFB’s excellent exposé, Pink Ribbons, Inc. Illustration from Pink Ribbons, Inc, © National Film Board.